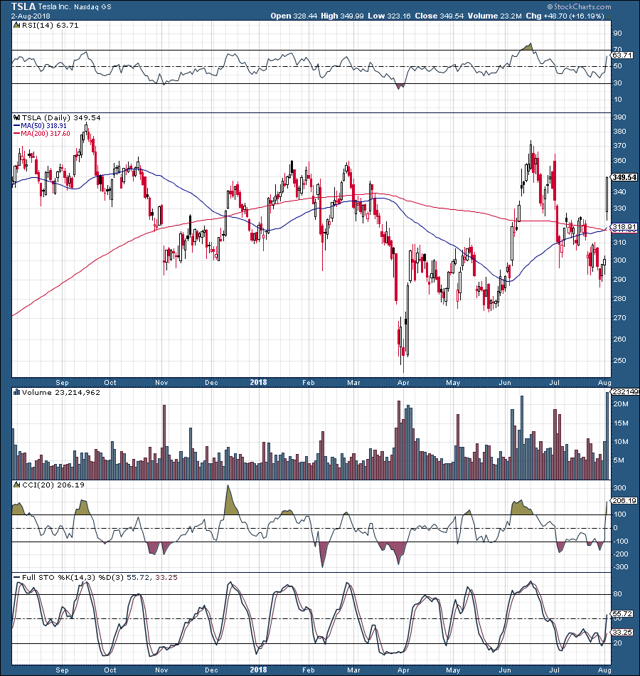 Tesla (TSLA) reported a wider than expected loss Wednesday after the bell, the biggest in the companys history. Teslas net loss for the quarter amounted to roughly $718 million, a considerable $4.22 cents a share. However, despite the enormous loss, Teslas stock surged by about $50, more than 16% the next day. So, why did Teslas stock takeoff following this record setting quarterly announcement? I provide 7 reasons why the stock surged, and why it is very likely to continue its path higher into year-end and beyond. Before we discuss the specific reasons why Teslas stock is likely to continue its upward trajectory lets go over some key data from Wednesdays Earnings announcement. At first glance the earnings report may appear weak, but things begin to look progressively better after a more thorough investigation. GAAP loss of $717.5 million($4.22 a share), a record which even eclipses Teslas losses achieved in the prior two quarters. The loss is more than double last years $336 million($2.04 per share) figure. This is worse than many analysts had anticipated and even beat my projections for a $650 million ($3.82 a share) loss for the quarter. Adjusted (Non-GAAP) loss of $3.06 per share, worse than the $2.92 loss analysts were looking for. Revenue beat by 2% or $80 million, coming in at $4 billion vs expected $3.92 billion, a 43% YoY increase. 2018 CapEx expected to be $2.5 billion vs $3.4 billion in 2017, less than expected. Cash position of $2.2 billion, much stronger than many analysts believed the company would have by now. Cash burn decreased by 22% sequentially from $900 million last quarter to $700 million in Q2. According to the CEO it is likely Tesla will produce 700,000- 800,000 total vehicles per year by 2020. The company also expects to be net income positive on a quarterly basis from here on (excluding special situations). The company reported a slightly higher than expected loss in the quarter, but it was primarily due to restructuring costs, gross profitability and production efficiency improved substantially in the quarter. In addition, Tesla has about $2.2 billion in cash on hand, is spending a lot less on CapEx YoY, beat revenue forecasts, and burned through much less cash than it did in the prior quarter. Now, for the 7 reasons why Teslas stock should continue to soar going forward. Teslas production capacity apparently achieved a 7K vehicle per week production rate a few times in July, producing roughly 5K Model 3s and 2K Model S/X vehicles (in one week). The company also said that it expects to have a sustainable 7K vehicle per week production rate throughout Q3. In addition, Tesla said it aims to turn out 6K Model 3s per week by the end of August. 7K vehicles per week is a staggering 250% increase over the 2K vehicles per week the company was producing just 1-year ago. Significantly increased production implies that Tesla can continue to improve on its success going forward. This also removes a lot of uncertainty investors were dealing with in the first half of this year, when the company kept missing Model 3 production targets. But increased production is just half the picture, Teslas profitability is also improving substantially. In addition to perpetually increasing scale, Tesla’s gross margins continue to improve quarter after quarter. This quarters automotive sales gross margin was 18.9%, compared to 18.3% last quarter, 16.9% in Q4 2017, and 15.4% in Q3 2017 (height of production hell). There is a clear trend here, as Teslas production efficiency continues to improve. Also, total automotive revenue (including leasing) gross margin increased to about 20.6% in Q2, a substantial improvement over last quarters 19.7%. Independently, leasing units gross margin came in at 43% this quarter, compared to 40% last quarter, and just 35.6% in Q2 2017. Tesla delivered 10,930 Model S and 11,370 Model X vehicles in Q2, using a $90,000 ASP for the Model S, and a $100,000 ASP for the Model X suggests that $2.12 billion of automotive sales revenues can be attributed to the Model S/X vehicles. The remaining $1 billion can be attributed to the 18,449 Model 3s delivered in the quarter, which gives us an approximate ASP of $54,200 for the Model 3 vehicle. Also, we learned on the conference call that Teslas Model 3 vehicle became profitable for the first time this quarter, delivering gross margins of about 3%, better than the expected breakeven point, and much higher than last quarters approximate -9% gross margin. This implies that Model 3s gross margin can continue to climb substantially higher and should attain a rate of around 15% in Q3, just as the company and some analysts forecast. A 3% Model 3 gross margin implies that about $30 million of Teslas $588.13 million automotive sales gross profit can be attributed to the Model 3 vehicle, and the remaining $558.13 million came from the Model S/X vehicles. This indicates that Model S/X sales gross margin also improved in the quarter from about 25% in Q1 to approximately 26.35% in Q2. It appears that Teslas manufacturing efficiencies continue to improve, which is ultimately driving gross margins higher. Teslas overall gross margin was about 15.4% in Q2, up from just 13.4% in Q1. As the company continues to adapt, improve, optimize and perfect operations, its economies of scale capabilities should propel margins substantially higher going forward. Model 3s gross margin could hit around 20% in Q4 and will likely stabilize at around 25% sometime in Q2 of 2019. 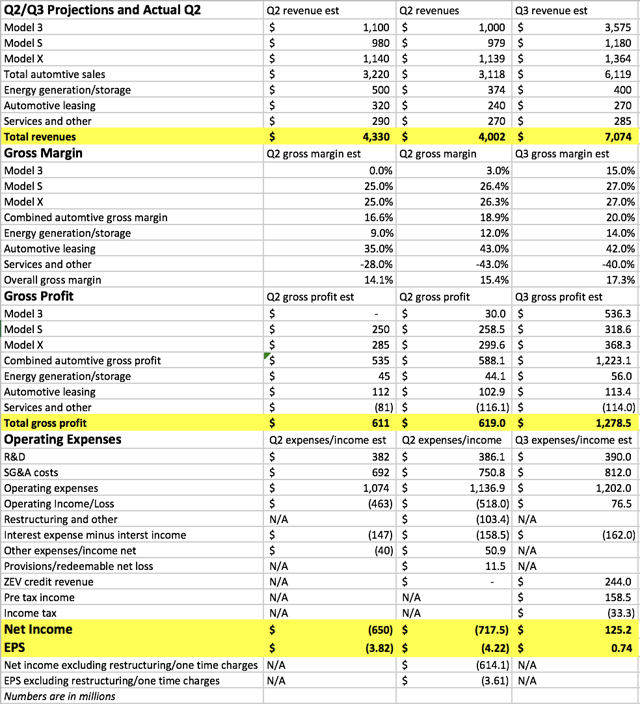 Model S/X gross margins could continue to improve also, and may level off at around 30% in future quarters. Energy Generation and Storage EG&S revenues declined from last quarter by 9%. This is not something you want to see, as generally this unit should be growing revenues every quarter. However, there is a likely reason for this, and it is the downsizing of Solar City operations. Tesla cut a lot of jobs pertaining to Sola City in the quarter and this is likely why the drop in revenues occurred. The silver lining is that EG&S revenues should stabilize and continue to grow going forward. Also, the companys gross margin improved, and is likely to strengthen as well in future quarters. Teslas EG&S gross margin improved from 9% last quarter to 12% this quarter, a substantial advance. Also, if we look at EG&S on a YoY basis, revenues surged by 30% from $287 million in Q2 last year. So, despite the sequential decline in revenues EG&S should continue to grow YoY, and is likely to become much more profitable due to the recent restructuring. Any way you look at it, the Model 3 appears to be by far the best selling premium sedan in the U.S. right now. 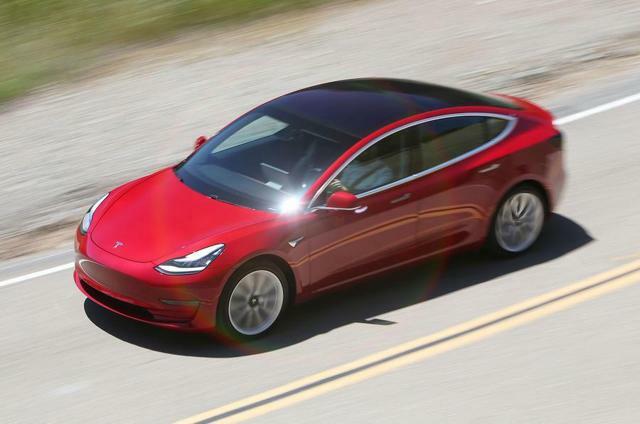 Recent estimates suggest that the Model 3 sold about as many units as its next 3 best-selling competitors combined amongst all small and mid-sized luxury sedans in July. 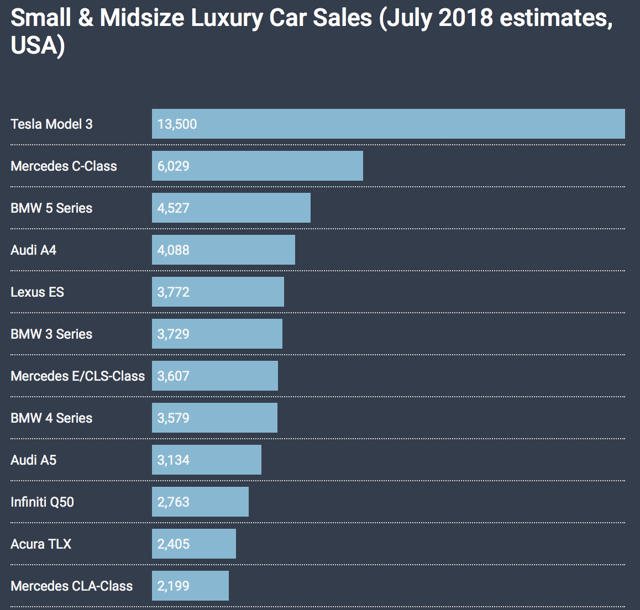 In addition, using a metric Tesla employs to gauge the mid-sized premium sedan market, the Model 3 outsold its 5 nearest competitors combined in July, including BMWs 3 Series, Mercedes C-Class, Audi A4, Lexus IS, and Jaguar XE. 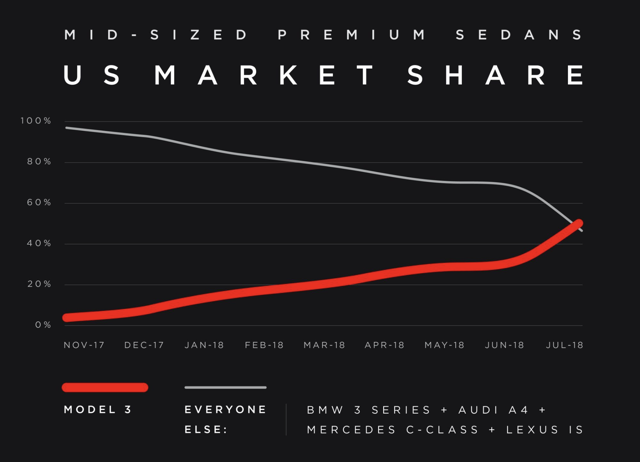 Furthermore, we see that Model 3s upward market share trajectory is likely to continue going forward. 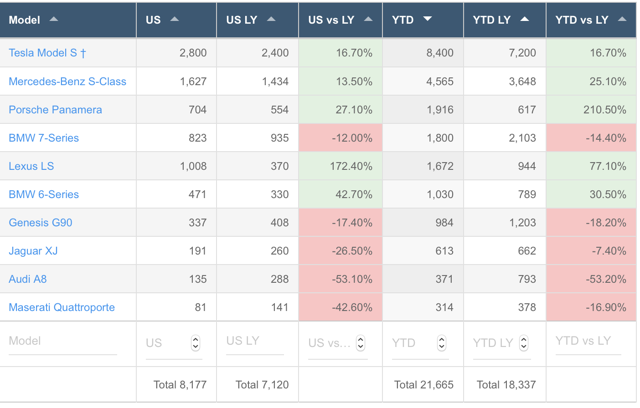 The underlying 5 competing vehicles sold over 210,000 units in the U.S, last year. This implies that if the Model 3 can sustain this level of demand, and possibly increase it going forward it is looking at a sustainable annual demand for at least 200,000 Model 3 vehicles in the U.S. alone. As far as sustaining demand and market dominance, weve seen the Model S dominate the large luxury sedan market in the U.S. for years now. 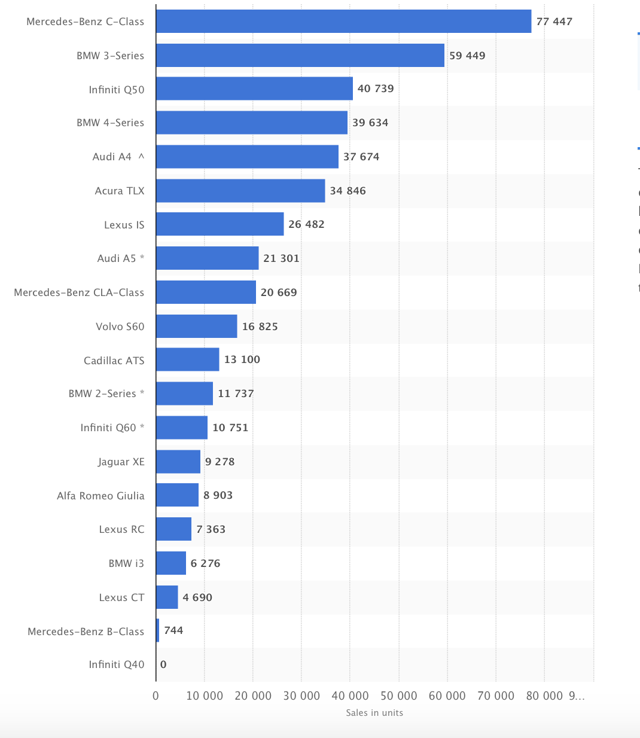 Typically, the Model S outsells, or sells about as many Model S vehicles as its 2 or 3 nearest competitors combined. Also, the Model S was the best-selling luxury sedan in Europe as well last year. Thus, the Model 3 could achieve a similar, or an even higher level of dominance in its much larger respective sectors. Despite the constant rhetoric about Tesla running out of money and needing to raise capital in the future, the company reported a surprisingly strong cash position. The company had about $2.2 billion left in cash at the end of Q2. This is only about $800 million fewer than the company had at the end of Q2 2017. So, without a capital raise and despite losing over $2.7 billion from operations over the last 4 quarters, Teslas cash position has only decreased by $800 million. This suggests that the company is experiencing very strong demand for future products, and is receiving substantial deposits for the Tesla Semi, and Roadster 2 vehicles. A stronger cash position also illustrates an increased level of responsibility on the companys behalf, and should serve as a favorable factor in the future if the company does chose to tap markets for capital going forward. Teslas plans to move aggressively into the worlds largest vehicle and EV market require a local factory to maximize success. 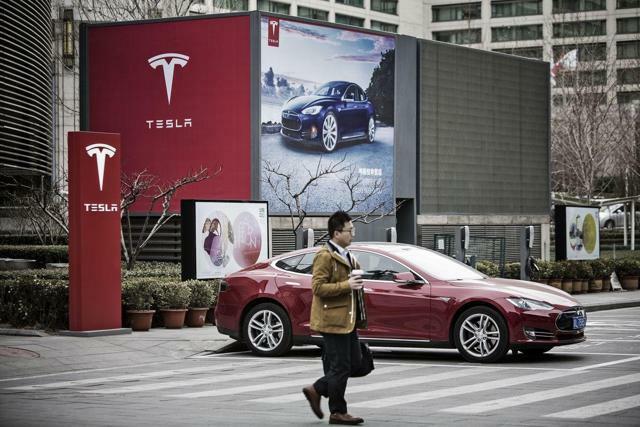 China is already one of Teslas best markets with about $2 billion in sales coming from China last year. With a Gigafactory on the ground in China Tesla will be able to flood the local market with freshly built Teslas at maximum efficiency, and profitability for the company. Tesla claims it will be more efficient with CapEx, likely having to utilize $2-2.5 billion to achieve annual vehicle production of about 250K. Also, the company will likely secure funding from local banks. Overall, concrete developments in regards to the Shanghai factory are essential to Teslas successful growth in China and Asia in general, and are very beneficial for the companys stock price long term. Tesla is not running out of cash, production efficiency continues to improve, demand remains extremely robust, the company is expanding into China (the worlds largest EV and overall car market), and is likely to become net income positive in the second half of this year. Also, it is possible that Tesla starts reporting profits from heron in, and very plausibly the company may become extremely profitable in the next few years. No-one knows exactly how profitable Tesla can become, the sky is essentially the limit, and this is precisely why Tesla is such a dangerous stock to short. While the level of future profitability remains somewhat unclear, it does not present a good enough reason to short this stock in my view. What is clear, is that revenues should continue to grow substantially at Tesla, supported by current facilities until at least 2020. After that, the Chinese Gigafactory will likely be online, and following that the Model Y, Tesla Semi facility should be opened. Therefore, extremely robust top and bottom line growth can continue for many years at Tesla. Nevertheless, Tesla remains the most heavily shorted stock in the land, with a purported short position of about $12-13 billion. A staggering 32% of float was short in recent days, so as the short thesis crumbles many short sellers appear to be scrambling to close out their positions, which is exacerbating the post earnings up move in Teslas stock. The enormous short position should also continue to help support a higher stock price on future positive developments. Tesla expects to achieve GAAP-net income and cash flow positive quarters from here on out. In fact, if you factor out restructuring costs Teslas latest quarterly results look much better than many had expected. Most notably, Teslas production efficiency is strengthening substantially, which is evidenced by the companys increasing gross margins. Sequentially, Teslas overall gross margin increased from 13.4% to 15.4%, and is likely to grow to about 17.3% next quarter. Also, due to increased Model 3 production, and the high number of vehicles in transit from Q2, Tesla should deliver substantially higher revenues in Q3. The company said that it expects to deliver about 50,000-55,000 Model 3s produced in the quarter, in addition to the 11,166 Model 3s in transit at the end of Q2. Therefore, Tesla could deliver roughly 60K Model 3s in Q3, and if we apply a $55,000 ASP, Teslas Model 3 revenues alone could be about $3.575 billion. Substantially higher revenues coupled with increased profitability should get Tesla very close to net income positive next quarter. However, if that is not enough Tesla likely has a lot of ZEV credits it can use to compensate for any quarterly shortcomings and considerably increase profitability. Tesla has employed a similar strategy before, when it sold its saved-up ZEV credits to boost its bottom line by $139 million in Q3 2016, helping the company flip a loss into a $22 million quarterly income. Although ZEV credits are available to be sold at any time Tesla hasnt used any of its credits in at least 2 quarters, suggesting it is getting ready to use them in the second half of this year to help propel the company into profitability. Great research provided by other contributors on SA concerning ZEV credits implies that by stockpiling ZEV credits over past quarters Tesla will likely have enough ZEVs to turn into nearly $500 million in Q3. However, using fewer than half should enable the company to add approximately $244 million to its bottom line in Q3, which could be enough to generate a healthy net income for the quarter. Source: Author’s Material – Reported Q2 vehicle revenues are estimates based on all available information. Teslas SG&A costs moved up noticeably higher in the quarter to about $750 million, nearly a 10% increase QoQ. This was higher than many analysts were expecting, and could continue to drag on potential profitability going forward. Therefore, Tesla needs to continue controlling its SG&A costs for gross profit to start substantially outweighing operating expenses and deliver net income for shareholders. Teslas Services and Other segment continues to be a troubled spot, with a -43% gross margin in Q3. This unit hemorrhaged over $116 million last quarter and is likely to underperform going forward. Tesla should work to improve profitability, or at least mitigate losses in this unit as it continues to drag down overall profitability. There are numerous reasons why Teslas stock should continue its path higher from here, but some of the most instrumental factors include, improving manufacturing efficiency, increased profitability and margin expansion, robust Model 3 demand and market dominance potential, a stronger than expected cash position, concrete details on China expansion, the seeming unraveling of the short thesis, and the increased likelihood of net income profitability in the second half of this year. Due to the underlying factors, I am much more comfortable with my long Tesla position now than I have been at any time throughout the past several years, and I fully expect Tesla to achieve my year end $500 price target. If you enjoyed reading this article, hit the “Like” button, and if you’d like insight about some of my future ideas, press the “Follow” link. Thank you for reading! If youd like to learn more about how to best position yourself for a rally in Tesla and to receive information about other high alpha ideas, please consider joining Albright Investment Group. Subscribe now and receive the best of both worlds, deep value insight coupled with top-performing growth strategies. Join and get access to FULL ARTICLES that include technical analysis, trade triggers, comprehensive trading strategies, portfolio allocations, and price targets. 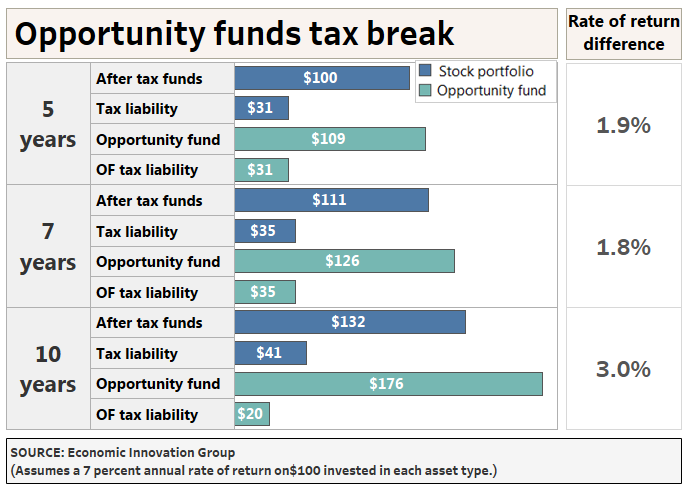 Enjoy access to my best investment ideas, and trade alongside AIG’s top-performing core long portfolio which has outpaced the S&P 500 by about 73% over the past year. This entry was posted in Bank Stocks on August 8, 2018 by admin.